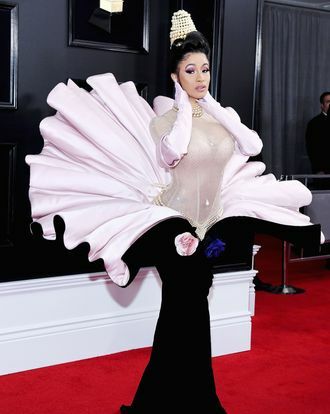 Cardi B looked like beautiful undersea creature at the 2019 Grammys. She showed up in a dress that emulated an oyster shell where she was the pearl, a design by Thierry Mugler. In case the metaphor wasn’t crystal clear, she wore a pearl necklace and a matching hat. The look was from Mugler’s 1995 couture collection, which was deliciously dramatic (much like B). Her pearl-encrusted updo was put together by her longtime collaborator Tokyo Stylez. She was ushered onto the red carpet by her team, because her skirt was so tight it looked like she had difficulty walking. And while she was on the carpet she touched tongues with Offset. It’s all a lot to process, honestly, but the most important thing is that she showed up in an oyster costume to the Grammys. (8) A Ferrero Roche tower. Thanks Cardi, for sacrificing your ability to walk comfortably in the name of fashion.